An area I’ve been digging into lately, Twitter Games, got a boost today with the launch of http://PlaySpymaster.com — created as a “side project” by the iList team. First impressions are good, quality implementation, but I wonder how the tweet noise will impact users as more games hit the stream. Luckily SpyMaster is early so game-fatique hasn’t set in…yet. Strength in the game comes from the size of your “spy ring” so if you’d like to join the fun comment here or follow/@ me on twitter. Rafe’s coverage of the Churchill Club Top Tech Trends is worth sharing. Jurvetson’s observations about distributed search are very similar to some I’ve been investigating. For every explicit action people take on the web (e.g. creating a link that GOOG indexes), there are 10X+ implicit actions (e.g. browsing, scrolling, video abandons) that are not being indexed for intelligence today. There are distinct efforts happening within content indexing, social feeds and webmaster analytics (largely implicit action data) that, when combined, will deliver maximum search intelligence. Much of the “Real-time web” excitement around Twitter, FriendFeed, Facebook and others still focuses on explicit actions (e.g. status updates), but the best value will come from the real-time, socially-curated, implicitly-indexed web. What are your thoughts on the 12 trends highlighted below? I always enjoy wild hand-wavey prognostications about the future, so I was pleased to attend the 11th annual Churchill Club Top Tech Trends event last night, moderated by my former co-workers from Red Herring, Tony Perkins (now running Always On) and Jason Pontin (publisher of MIT Technology Review). Of the 12 trends, two really made me take notice. Most of the rest, which you can see at the end of this story, were pretty standard projections from existing market circumstances. Trend prognosticators, left to right: Tony Perkins, Vinod Khosla, Steve Jurvetson, Ann Winblad, Ram Shriram, Joe Schoendorf, Jason Pontin. Venture capital whiz-kid Steve Jurvetson gave an impassioned pitch for this trend, which he called, “The triumph of the distributed Web.” He said the aggregate power of distributed human activity will trump centralized control. His main point was that Google, and other search engines that analyze the Web and links, are much less useful than a (theoretical) search engine that knows not what people have linked to (as Google does), but rather what pages are open on people’s browsers at the moment that people are searching. “All the problems of search would be solved if search relevance was ranked by what browsers were displaying,” he said. Jurvetson believes that the future is “federated search,” in which the Web’s users don’t just execute search queries, they participate in building the index by the very act of searching, immediately and directly. What I find most interesting about this concept is that we can see it already happening, although via a different technological vector. Twitter Search is real-time search. It tells you what people are saying right now, and on popular topics, it gives you far more current information than Google. I think Twitter Search also shows us that Jurvetson’s vision of search, while compelling, is incomplete. To get the real-time wisdom of the crowds for the purpose of search, you have to know not just what Web pages people are displaying, but exactly what is on those pages, and you probably also want to know what’s showing up on users’ computers in apps other than the Web browser. I am not sure the Web’s users will want to participate in the creation of this search engine, nor am I convinced that there’s a lot of value in the concept for obscure or “long tail” search queries. But the idea is interesting, and I certainly agree that the value of real-time searching, as well as social-network-aware searching, will increase dramatically and quickly. Moderator Jason Pontin, a self-described liberal who “finds our president as dreamy as the next man,” broke party rank and echoed a popular sentiment in the room of wealthy (and traditionally mostly Republican) venture capitalists, to say that the Obama administration’s plan to invest in new technologies is doomed to fail. While acknowledging that the administration’s heart is in the right place, he pointed out that traditionally, direct investment in technology by governments doesn’t work out well. He said the United State’s subsidies on ethanol, France’s decision to skip the Internet in favor of the state-sponsored Minitel, and Japan’s direct investment in supercomputers as it tried to spend its way out of a recession were examples of poor investments. “Government is a particularly poor judge of new technology,” he said. While I agree that best role of government, when it comes to new technology, is to encourage ends and not directly fund means (you can encourage energy independence in general without paying for particular technologies), it’s not always the case that government can’t play well in this field. The CIA’s venture firm, In-Q-Tel, for example, actively fosters the growth of start-ups, and many of the technologies developed on those dollars have national security as well as economic benefits. In-Q-Tel portfolio company Ember, for example, has contributed to the development of the ZigBee wireless standard that will end up in the next generation of smart appliances. Panelist Vinod Khosla’s earlier trend, “Maintech not Cleantech,” was in the same vein. Khosla doesn’t think government subsidies will drive down carbon emissions. (He also thinks that “fringe” environmentalists don’t make much of a dent. “Five percent of Californians will buy anything,” he said, referring to the Prius.) Khosla’s money is where his mouth is: His “renewable portfolio” has funded companies working on fuel technology, engines, building materials, and plastics. “Nobody wins betting against Vinod,” panelist Ram Shriram said. 1. The millennials are here. Everything changes. The current generation of graduating college students won’t remember a life offline. 2. Advanced batteries will be most popular energy investment in ’09 and ’10 and will provide best returns in the medium term. 4. Wireless broadband will be one of the only IT sectors to see increased funding this year and in the future. 6. Power and efficiency management services will see a flowering through investment and innovation. 9. Consumption of digital goods on mobile devices is the growth story of the coming decade. 10. Electronic displays will prove the hottest investment in hardware this year and next. 12. The rumors of the demise of the reporter have been exaggerated. The National Venture Capital Association (NVCA) annual meeting kicks off today with a great mix of sessions and speakers. At a policy level, NVCA Chairman Dixon Doll is also announcing a four pillar plan to help increase liquidity via IPOs. Pillar I – Ecosystem Partners: consolidation and attrition has limited the number of mid-tier accounting/legal/i-banking firms who can help smaller companies reach the public markets — at least at a manageable cost. The NVCA is encouraging a new set of ecosystem participants and partnering with the largest players in the industry to do the job better. Pillar II – Enhanced Liquidity Paths: The NVCA is endorsing alternative distribution between buyers and sellers that grows buyers and their commitment to holding long-term. One example provided was Inside Venture, which pre-screens cross-over investors who agree to hold long-term. Pillar III – Tax Incentives: From globally competitive capital gains rates, to carried interest taxation, to one-time IPO-related tax incentives; the NVCA advocates a suite of tax initiatives that will encourage investment and company growth. Pillar IV – Regulatory Review: Sarbanes-Oxley and a host of other regulatory moves have created various unintended negative consequences and costs for smaller venture-backed companies. The NVCA advocates a tiered approach to regulation to recognize the different circumstance of large and small public entities. The full NVCA presentation can be viewed below. It contains a good set of data behind these recommendations, including the impact venture-backed companies have on our economy (12.1M jobs created). I’ve recently been coaching some entrepreneurs presenting at upcoming investor conferences. It’s something I’ve done for years and still enjoy. I remember the first investor pitches I gave and the first I heard, and can appreciate how “blind” many entrepreneurs are flying when doing their first investor presentation. Although my advice is always tailored to the entrepreneur and company at hand, there is one nugget I try to share with all. Remember the goal of your presentation and don’t wander too far from it. In most situations, the goal is to Excite, Engage & Exit with the Ask. Excite: Focus on what is most exciting about you and your business. Don’t get bogged down in re-hashing your business plan. If your technology is truly disruptive, make that point clear. If your team brings significant experienced or unique relationships, hit that. If customers are seeing immediate ROI from your products, put that front and center. Your number 1 job in an investor pitch is to generate excitement, preferably very early in your presentation. Getting audiences to shift forward in their chairs and pay attention is much more important than hitting the “textbook” areas of business analysis. Engage: If the forum is a conference, then Engage means to deliver your message in a way most people will understand. Ditch the technical jargon and provide real-world examples of creating value for customers. If there is a unique pain point for your customer, share that story because it could evoke immediate understanding/emotion from your audience. If the forum is a partner meeting, then also look for opportunities to bring the audience into a discussion. Ask “how often X has happened” to them, their companies or their families — something you fix. Ask about the firm’s approach to investing so you understand them better and can relate to that in your presentation. Do something to drive two-way discussion — a partner meeting presentation that goes one-way is almost always deadly. Exit with the Ask: Always, always, always end with a slide that details what you’re asking for or proposing. Don’t douse audience excitment with a dead-end close. You need to funnel the audience’s interest in your presentation into a decision point. Note, however, that the ask isn’t always just an investment amount. To the contrary, the ask at a conference may just be to get audience members to your booth for further questions. The ask at a partner meeting typically involves a dollar amount, but also includes understanding process “next steps” — driving due diligence or a subsequent meeting. By presenting your Ask to an excited and engaged audience, with your key Ask, you’ve maximized your chances for success. At the worst, making the Ask will help you avoid wasted time. If you didn’t excite the listener and they don’t react to your Ask, it’s a good sign to improve your pitch and focus your energies on your next prospect. As an executive my primary motivation is to act for the good of my company, not just my own financial gain. No one at our company will earn a guaranteed base salary more than 40 times of our lowest paid worker and we will offer the same health care and 401(K) matches to employees as we do for executives. We support pay for performance, so when our company’s performance serves investors and employees, we’ll share in the gains. When our company’s performance does not adequately serve our investors and employees, we’ll share in the sacrifice. Bob claims that inappropriately high executive compensation is a ripe source of capital for employing more people. The general idea of CEOs aligning their comp with company performance is great, but Bob’s supporting examples, conclusions and resulting pledge are seriously flawed. The prime examples Bob uses for CEOs doing it right and wrong are Tom James of Raymond James Financial and Robert Iger of Disney. I’ll start by saying I’ve had the opportunity to meet Tom James and I’m a big fan of his, as an entrepreneur and a manager. I’ve never met Robert Iger, but I also know you don’t get to his level without creating value on many levels. Bob quotes James’s $325K base salary, less than 20 times the salary of RJF’s lowest paid employee. He then quotes Iger at $51 million, but that looks like total comp — various sources quote Iger’s base salary as $2,000,000. That exaggeration, however, is just a small piece of the bad math at play here. James owns over 13 million shares of Raymond James, or about 11% of the company — not including any additional shares he may have in various family trusts. That 11% is worth north of $250 million! This is a high % for a CEO of a multi-billion dollar enterprise; but that’s what you get when a CEO was also the founder. 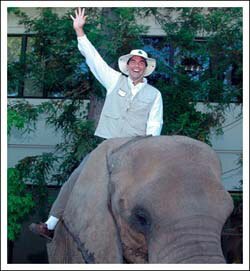 Iger, on the other hand, was not the founder of Disney and his total package reflects this. He owns just 576K shares of Disney, or about .03%. That’s worth about $10 million. Given the huge disparity between their ownership positions, 11% vs. .03% (a 300X disparity), let’s consider what happens when they create shareholder value. When James creates 10% of shareholder value, he creates about $230 million of total shareholder value, and his personal shareholder value grows by $27M. When Iger creates 10% of shareholder value, he creates about $3.9 billion of total shareholder value, but his shareholder value grows by just $1 million! No wonder non-stock compensation is so different for those two CEOs, demonstrating why base salary is a terrible measure for comparing CEO comp packages and as a litmus test for CEO/company “patriotism”. It’s also worth noting that the arbitrary 40X ratio (CEO base salary vs. lowest employee base salary) is equally wrong-headed. If the goal is aligning interests of employees and shareholders, then pay should relate to the employee’s potential to impact shareholder value. The idea that the least-paid employee at Disney is responsible for 1/40th the shareholder value as the CEO strains reason. I’m a big believer in employee empowerment up and down an organization, but the reality is that CEOs of large corporations impact shareholder value at a scale orders of magnitude larger than the least paid employee. I like to think I was a talented, underpaid young engineer when I started at IBM, but I didn’t come close to creating the $180 billion of shareholder value Lou Gerstner did over his tenure. Understandably, comp packages mirror that real-world responsibility and disparity of impact. In honor of FAQFriday, this post is about a bunch of questions our society wrestles with daily. I hope the example I share doesn’t trivialize the magnitude of the questions…although I usually try to answer questions on FAQFriday, I’m the one asking today — and I expect some answers! Last weekend my family drove down to Tampa to see the Gasparilla Parade (there’s another next weekend). Having grown up in Tampa, attending the parade is a 30+ year tradition for me and we always have a great time. This year was a bit different, though. Both of my daughters had the opportunity to walk in the parade so my wife and I watched with our extended family. We had a blast, but without my daughters sitting with me I found myself paying closer attention to the capitalism vs. socialism struggle around parade seating. You see, my family has always been the type to arrive early (10am) and create a great viewing area for the parade (3pm). Because we arrive early, we reserve parade-side seating in a chair-encircled area about 10 feet deep and 20 feet wide. We set out lawn chairs, blankets and coolers in anticipation of a full day of family, floats and fun — and beads! Between 10am and 1pm, thousands of other parade goers arrive and follow the same tradition, with chairs, blankets, coolers, and family — creating a crowd of 50,000 about one-family deep along the entire route. I’ll call this group the “early-arrivers” class because they sacrificed their morning, arrived early and created a comfortable space for their families. Then, between 1pm and the parade’s 3pm start, the other 450,000 people show up. I’ll call this group the “late-arrivers” class. The earliest of these are probably a “middle-class” of parade space who don’t get front-row seats, but still have decent space in between the early-arrivers and late-arrivers flowing in as the parade starts. First, the late-arrivers almost immediately start swallowing the middle-class because of their sheer numbers and because the middle-class didn’t arrive early enough to secure their space from plunder. That equalizes and aligns everyone off-street, envying the prime space held by the early-arrivers — even though the floats are large enough to be seen by all classes and there will be more parade beads thrown, to all classes, than anyone cares to keep. Then, for the rest of the parade, it’s open class warfare as the late-arriver masses slowly consume the prime viewing areas created by the early-arrivers. It starts with the late-arrivers trotting out their saddest cases for “spreading the wealth” — their smallest kids. This is a very successful tactic, as most early-arrivers voluntarily reduce space for their own kids to pack the curb with the newcomers — even though it significantly alters the experience from a comfortable family gathering. Then, once their kids have space, the late-arriver adults either wedge themselves behind/beside their kids or they begin the drum-beat of “spreading the wealth” with others — full-scale class warfare is at hand. While some battle with words, many others physically start moving chairs, coolers, blankets to take more space. As some do it, it emboldens others until…eventually…the wealth has been spread to all. The parade ends with the late-arrivers having equal (sometimes better) space as the early-arrivers and the early-arrivers trying to find the lid to their cooler that was successively kicked behind the masses. 1) Why do the late-arrivers feel this is “OK” or appropriate behavior to teach their kids? What do kids from each class learn from it? 2) How would it all change if parade goers weren’t just splitting confined space, but early-arrivers actually “created” space by their arrival (more analogous to how entrepreneurs create jobs and wealth in society)? Would the late-arrivers feel any more or less entitled to equal space? 3) Does any of this feel different if we just change the labels from “early-arriver” to “rich” and “late-arriver” to “poor”? 4) How would it all change if there was a governing entity who announced that the early-arrivers were expected/required to share with the late-arrivers — the more you have, the more you have to share? Would it reduce the number of early-arrivers? Would it cause late-arrivers to be even more brazen in their takeover, because the “spread the wealth” mindset was sanctioned from above? 5) What would happen if everyone, early and late arrivers, voted just before the parade started on how to split the space and the majority ruled? Would such a vote alter people’s behavior in future years? 6) There will always be more late-arrivers than early-arrivers, it’s the nature of people and a bell-curve of personalities. 7) Is this one-day experiment an accelerated view of what brings down societies over hundreds or thousands of years? Is “parade day” coming for the world, with its own distribution of “early-arrivers” and “late-arrivers”? I had the opportunity to once again attend the Foley Leadership Series sponsored by the Foley Lardner Law Firm meeting held a few weeks back at the CityArts Factory on South Orange Ave. in downtown Orlando. This facility is a way cool place to visit as it’s an old theater (built in 1916) renovated and converted into a number of art galleries on the first floor—complete with a working glass arts studio—and a full size theater on the 2nd floor with adaptability to hold and cater to a fairly large conference group. For those of you into interesting art and architecture—it’s a “must see” and a good reason to visit downtown Orlando. The conference gave a nice update on current cancer research being conducted at the Burnham Research Institute along with an update of the progress on opening the Lake Nona medical complex (read more in a nice article by Robyn Shelton). For those of you not familiar with the Burnham Institute for Medical Research, it’s a world class research center originally based out of La Jolla, California with over 600 scientists on staff on the west coast. They are currently located in a temporary 14,000 square foot space in southwest Orlando, but plan to open a 175,000 square foot facility in the Orlando Lake Nona medical research campus (located between the Orlando International Airport and the University of Central Florida in southeast Orlando). The institute is still on track to complete “phase 1” and open this April. They currently have around 65 employees and will expand to over 300 employees as the institute goes forward. Although Burnham does research in various biomedical area, the focus here in Central Florida will be on diabetes and obesity—a field that is relatively understudied in the basic sciences. Florida will provide an excellent source of patients for clinical investigation as our State has a fairly high rate of both obesity and diabetes. Current research being done at other diabetes centers around Florida will also provide opportunities for collaboration. Burnham is poised to become a serious player in the life sciences with easy access to just about any other biotech center in Florida along with being adjacent to a good airport. It’s good to see the biomedical industry really taking shape here in Florida. California and Massachusetts—take note! You have probably already heard that VCs love to back serial entrepreneurs, but why is that? What makes them special? Well, it’s a mix of things, but one trait I’ve witnessed across a decent sample size is the ability to prioritize and reprioritize in a nimble, but thoughtful fashion. All entrepreneurs are risk-takers, but the best are Riskmasters. The skill shows itself early in the life of a company, particularly when founders plan their funding path and use of seed funds. Given many possible to-dos in the early life of a company, first-time entrepreneurs will often prioritize the easiest items first or focus on developing the full-function product they envision. Serial entrepreneurs, however, immediately start prioritizing risk reduction. In particular, they focus on the todos that address the largest risks in the business or the largest hurdles to securing institutional funding. Those may be the hardest todos, but they know all other progress is a phantom until the most important risks are addressed. One of the most effective prioritizations is to realize that first generation products don’t have to do everything. In fact, it’s worthwhile to ask “what is the minimum the product has to do for a customer to buy or an investor to feel core technology risk has been removed?”. Reaching a v1.0 sale is huge for company value creation and attracting investors. The same holds true for management risk. Investors don’t expect a full management team, particularly if it’s filled with B players. Serial entrepreneurs prioritize the key hires that are needed to execute the business or secure funding. Lastly, the same holds true for market risk. If the key question for investors is market size, serial entrepreneurs prioritize data gathering to prove a large market. If the key question is competitive threats, they prioritize functionality or partnerships that provide a unique competitive advantage. The benefits of this prioritization are multifold, but at least two important outcomes occur early. 2) Institutional investment comes earlier as key risks are removed, providing capital and relationships to accelerate the business sooner. What are some examples you’ve seen of Riskmasters, where prioritization simplified execution or fundraising? FYI: Although I used serial entrepreneurs as an example of a Riskmaster, they can come in all shapes, sizes and experience levels. My former partner Tim Draper (pictured above), who coined the term Riskmaster for entrepreneurs, has started his own blog on entrepreneurship and venture capital. If you haven’t already subscribed, you probably should — the man is smart and crazy, like a fox. Despite my time off the grid for the holidays it was hard to miss some of the buzz around the recently announced Florida Opportunity Fund. It didn’t hurt that I’ve been following the topic closely for the last year — you can imagine it’s close to my heart. The origin of the Florida Opportunity Fund stems from legislative action in 2007 creating roughly $30M of capital focused on in-state early-stage venture capital: 2008->Chapter%20288->Part%20X”>The Florida Capital Formation Act. The logistics of deploying that capital properly is that Enterprise Florida was given the responsibility and funding to create a custom fund-of-funds (FoF), including a governing board and professional FoF managers. The governing board was announced back in 2007, including Pete Pizarro, Kenneth Wright, Diane Cook, Paul Hsu, and Andy Hyltin. The recent announcement covered the selection of its FoF manager: Florida First Partners, a joint-venture between Milcom and Credit Suisse-Customized Fund Investment Group. That announcement essentially signals the Florida Opportunity Fund is open for business and looking for quality Florida-based venture funds to leverage Florida’s pool of talented entrepreneurs and world-class technology into superior venture returns. Jennifer Dunham and Melford Carter are the current contact points for inquiries. So, those are the facts, what’s my interpretation? I think it’s another smart step in the right direction. A pool of $30M split among a few early-stage venture funds isn’t going to change the state’s venture ecosystem overnight. However, I’ve seen firsthand how quality in-state lead investors bring national venture dollars to the state. For example, Inflexion, Florida’s Venture Fund, has experienced 11-18 dollars of co-investment for every Inflexion dollar invested into early-stage companies. Now that the politicians have taken a key step, setting up the fund with its core goals, it falls to the Florida Opportunity Fund to deliver on those goals, in the face of a difficult macro-environment, plenty of naysayers and likely political pressure along the way. Florida presents unique challenges and opportunities for early-stage venture funds, requiring local access to multiple hotspots across the state combined with national relationships. Early-stage company building is a local business and flying in for periodic board meetings, even by the largest funds in the country who will claim some Florida connection, just doesn’t cut it for early-stage. Local effort + national networks + quality track records = superior investment returns for the Florida Opportunity Fund. That said, just as Inflexion alone hasn’t filled the early-stage venture gap in Florida, the Florida Opportunity Fund isn’t a silver bullet. Participation by angel groups, the State Board of Administration and the state’s largest university foundations are also critical. However, if we’re all successful harnessing the vibrant and passionate technology entrepreneur and research base in the state, it will be a transformational success for Florida both in investment and economic terms. Almost all investment literature warns you that past performance is no guarantee of future results. That disclaimer usually prompts, for me, a juxtaposition with Einstein’s definition of insanity: “doing the same thing over and over again and expecting different results.” So, which is it? I have no idea, but I consider both of these concepts as I review portfolio revenue projections each coming year. We just completed that cycle for our portfolio and I’ve got a suggestion for every entrepreneur projecting year-to-year — plan your cash in the new year as if your past performance IS a guarantee of future results. Therefore, if you completely crushed your projections last year, get aggressive this year. However, if you’re like most optimistic entrepreneurs, and you didn’t hit all your numbers; incorporate that history lesson into your new year. Project as you might normally do, including your usual expectations of growth. Refine it with your CFO and others. Then, apply a discount based upon your prior year performance. If you only achieved 60% of your revenue plan; apply that same discount going forward. If you were able to run more efficiently last year, only spending 90% of plan; apply that same discount (to the positive) going forward. Don’t change your sales teams goals based on these discounts, but manage your cash (and project fundraising) as if past performance will hold true going forward. If you perform even better against your projections next year, great — you’ll have more runway to create value. 1) You should get better over time at projecting, so there is an argument for incorporating that expected improvement so you don’t unnecessarily sit on cash. In theory that’s true, but you’d be surprised how often the world throws new hurdles at you each year — so last year’s lessons aren’t as applicable to next year. 2) Significant changes in how the company operates, it’s business model, or it’s team; can make a big difference in hitting projections. Again, you could try to factor in improvements from key changes. My advice is not to assume those changes bring only upside — they often bring new lessons as well. I’ll end by saying I’m a pretty optimistic guy by nature, so it’s tough to advocate such a cautioned view. However, I’ve seen this story too many times — it’s much better to deliver upside surprises to yourself, your board and your investors, than the alternative. I hoped to incorporate some piece of Fred’s recent “Different Results from Doing the Same Thing” post; but the topics were just too different. That said, I’d still recommend reading his post. It dishes some knowledge on bridge financings and the auto industry predicament, all in one insightful post. Ok, enough already! Amidst all the economic “doom and gloom” from the daily news feeds—I actually do have something encouraging to share (well, at least for the moment until the Dow plunges another 10%). The National Venture Capital Association along with Pricewaterhouse Coopers released their VC funding update in its recent Moneytree Report for Q3 2008. PWC’s MoneyTree is a great site for info on VC investing trends on the national as well as regional levels with the capability to search by industry. Even better yet—it’s free with a simple registration. It seems that on a national level, VC investments have remained relatively stable (naysayers look out!) through the 3Q of this year at $7.1B. The biotech industry, which had fallen to 3rd place in the 2Q (first time that had happened since 2003) once again reclaimed its top position inching out software by a narrow margin of $1.35B to $1.34B. The medical device segment placed 4th at $864M, giving the overall life science sector (biotechnology and med device combined) a relatively strong $2.21B (and represented a 10% increase from the 2Q). This brings the 2008 total for all categories (through 3Q) to $21.6B and is on track to be in the same ballpark as 2007 when VC investments were $29.4B for the year. The life science industries do tend to be more resilient in difficult economic conditions—after all, people don’t stop getting sick and we still need to treat their illnesses. But in this market—anything can happen. When the ultra-conservative stock of Berkshire Hathaway moves up or down by more than 25% in a single day—you know we are not in ordinary times—and no company is immune to the current market conditions. Can we expect more good news or will VC investing get hammered by year end? 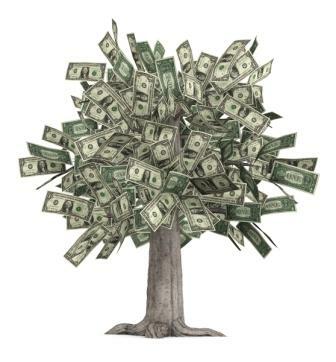 PricewaterhouseCooper’s managing partner, Tracy Lefteroff does not expect funding to dry up. “VCs have slugged through difficult times before and this one should be no different.” Personally, I’m not so sure. Stay tuned for the 4Q follow up in February 2009. It’s difficult to predict at this point, but I’m putting my bets on a tough market ahead. Dan’s Note: Short answer, if you can avoid raising a VC round in 2009, do so. Good deals will get funded, but given the increased macroeconomic and financing risks, valuations will take a hit — particularly during the next 6 months of uncertainty. The added creative innovation to bootstrap your runway to 2010 will also pay long-term dividends for your business. Upon opening my office snailmail today I was surprised to find a brochure publicizing a “Webcast Auction” liquidating AdobeAir® products. I didn’t remember MasterCool or ArchCircle apps based upon AdobeAIR. As I looked inside I was even more intrigued by the opportunity to bid on intellectual property including the AdobeAir® trademark. Of course, this auction had nothing to do with Adobe’s AIR web development platform (it involved manufactured cooling products), but the brand is ironic given how aggressive Adobe’s been on trademarks — they even went after the founder of freshAIRapps.com because it was a directory of AIR applications using “air” in the domain. Investors, employees, partners…everybody enjoys doing business with an entrepreneur who has successfully built multiple companies. 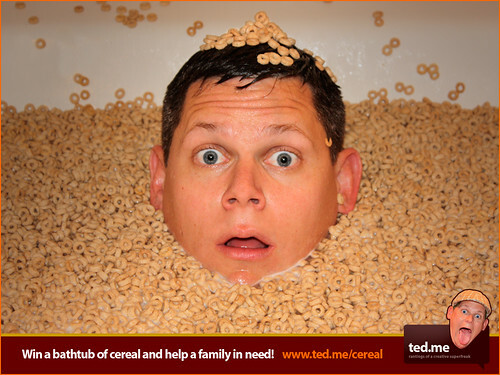 If that serial entrepreneur kicks off a charity contest involving a bathtub full of cereal, even better. Checkout what Ted is up to now. He’s announced a contest to give away a bathtub of cereal (52 boxes) to one lucky participant and, if his post generates 500 comments, another 52 boxes of cereal to his local food bank. To enter, just blog, comment and tweet about the contest — easy. Like many of the post comments, I also plan to donate anything I win to the local food bank. That’s over 100 boxes of cereal for some hungry kids and families as we head into the holidays. More details are included in this video…he even has a “making of” video over at his post. I’ve said it many times before, but people make or break any company. My “foxhole” post highlighted that teams grow in importance during the tough times. However, team cohesion doesn’t just happen, it takes work. When I first left college as an engineer, I’ll admit, team building exercises at IBM seemed hokey and hardly worth the effort. As I grew into management roles and then moved into venture capital, the value of team building became more obvious. As a VC I’ve had the pleasure of witnessing over 40 different entrepreneurs and senior managers build teams and I can honestly say the most productive teams, after exceeding 10 people, came from concerted senior management attention to build familiarity, values, vision and passion among teammates. What have you done this year to build team cohesion, and, in particular, what have you done since October, when the economy injected fear and uncertainty into your team? Likewise, as an employee or manager, in small companies and large, what are the best and worst team building activities you’ve ever seen?